With the Springfield leading trainer title in his possession downstate conditioner Mike Brink has his sights set on a sweep of the State Fair meetings when Du Quoin conducts its two day session this weekend. 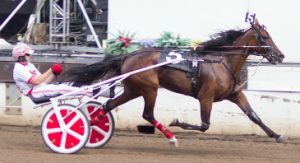 Two of Brink’s five winning horses at Springfield came in championships—Praise Singer in the 3-year-old filly trot and stable-mate Rock Hollywood in the aged male trotting event—and both trotters are back in to go in Saturday’s opening program at the Du Quoin State Fair. Praise Singer put $23,003 on his card as a freshman and while he had only one victory in 11 starts he was second in the Violet final, and third in both Balmoral’s Lady Lincoln Land and Du Quoin’s Shawnee showdowns. After a second place finish in her sophomore debut in a low-end Hawthorne conditioned trot, the Piazzazzed filly, didn’t get a check in her next five starts, all six place finishers at Hawthorne. After a month off between late June and late July Praise Singer came up empty in a leg of the Filly Dygert, finishing eighth, but she has done a complete turnabout in her last two when Ridge Warren took over her lines, going wire-to-wire ion her Springfield elimination (1:57.2) and again in the $30,000 Final, this time in a career best time of 1:56.3. “She had some stomach issues,” Brink replied.” She’s always been a very nervous filly. We started working on her stomach problems and she starting getting better and better. It’s a day-by-day, week-by-week thing with her. The Springfield morning line lists Praise Singer as the 3-1 second choice behind Powerful Princess (pp 4, Casey Leonard) who opens at 9-5. Violet champion Surviver DI (pp 6, Kyle Husted) is at 4-1. The Windy Skeeter field also lured Rockinprincessabbie (12-1, Kyle Wilfong), Ryleigh Marie (5-1, Dale Hiteman), Roma Falls (7-1, Matt Krueger) and Awfully Emotional (25-1, Mike Brink). Praise Singer will again be handled by Ridge Warren. The 27-year-old Illinois native was only one winner short of tying Casey Leonard for the top spot at Springfield. Casey will again steer Springfield champion Rock Hollywood away from the rail in the Aged Male Trot stake that will go as an early non-wagering event on Saturday’s card. The Harvard native will also be back in the sulky behind recent Dygert series leg winner on Hail Caesar in Saturday’s $21,000 Pronto Down stake. Hail Caesar is the 8-5 first flash choice Saturday after winning his last 3 and 4 of his last 5 for owner H H Wright of Morton, Illinois who also shares ownership of Praise Singer with South of the Tracks Racing of Brimfield, Illinois. The Powerful Emotion gelding didn’t compete at Springfield. He was scheduled to race in a prep for the 3-year-old male trot championship but was scratched. Brink also has Pass The Plate (12-1) and Powerful Father (7-2) in the Pronto Don stake. The ninth race on the 12-race program also brought out Speedy Rendezvous (9-2, Kyle Husted), Dr. Venkman (30-1 Curt Grummel), PJ Boy (6-1, Ridge Warren), Primed N Powerful (3-1, Freddie Patton Jr.) and Storm Winds (30-1). Du Quoin Viewing Available: A reminder that you won’t be able to watch and bet on the Du Quoin races on your favorite ADW outlet due to the fact the Illinois Department of Agriculture lacked the necessary funding to do so. However the races can be viewed online at www.duquoinstatefair.net under the “Entertainment” and “Harness Racing” tab. Post time each day is Noon.